All dormant apple trees need a specific number of "chilling hours"--periods with temperatures below 45 degrees Fahrenheit--before their spring growth starts. Most apple varieties need from 500 to 1,000 chilling hours each year. A small number of apple cultivars, however, can get by with fewer than 500, says Kathie Carter of the UC Riverside Cooperative Extension's Botany Sciences Department. These are the apple varieties suitable for hot climates. Developed in Israel, "Anna" needs 300 chilling hours. Its late May to June fruit lasts up to two months when refrigerated. To set fruit, Anna requires cross-pollination from "Golden Dorsett" or "TropicSweet" trees. The tree's crisp, red-green fruit is slightly more sweet than acidic, according to the University of Florida IFAS Extension. Average weight for its 2.5-inch, oblong apples is 7 oz. "Anna" is Florida's best-selling apple cultivar. A Bahamian apple cultivar, "Dorsett Golden" sets fruit with only 250 chilling hours. The University of Arizona Extension suggests it may require even less. Highly resistant to browning, its red-striped, yellow or green fruit averages 5.3 oz. Like "Anna," its apples are ready for harvest in late May or June. "Dorsett Golden" is an upright, medium height tree. It needs cross-pollination from "TropicSweet" or "Anna." 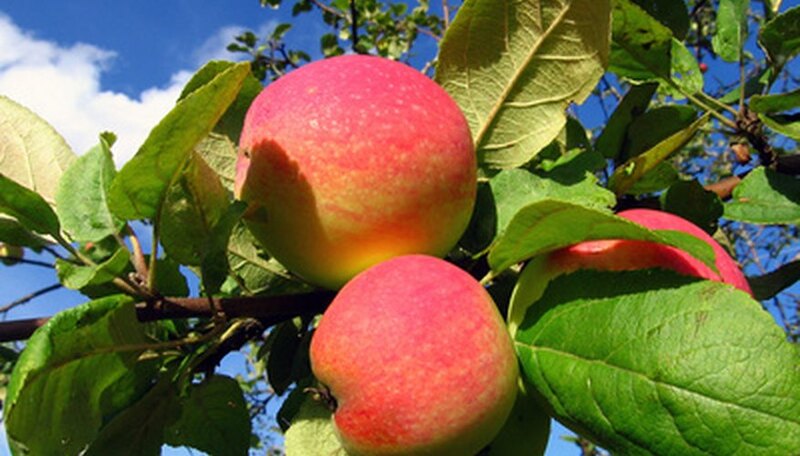 "TropicSweet" is a spreading tree with very sweet, red-and-green apples of 7 oz. Like "Dorsett Golden," they're extremely resistant to browning. Developed in Florida, this patented cultivar needs 300 chilling hours to produce May and June fruit. The crisp apples store from six to eight weeks in the refrigerator. Cross-pollinate this tree with "Anna" or "Golden Dorsett." "Ein Shemer," an Israeli cultivar, performs well even in the low California and Arizona deserts. The University of Arizona Cooperative Extension estimates its chilling requirement at as little as 100 hours. "Ein Shemer" has red-and-yellow, medium-textured sweet fruit averaging a little over 6 oz. This tree will cross-pollinate "Anna." With a chilling requirement of 250 hours, "Early Dawn" is a disease-resistant apple cultivar that performs well in California's coastal areas. Its August-ripening, red and yellow apples average about 8 oz. They have crisp, fragrant flesh good for snacking and cooking, according to the Urban Permaculture Institute. Another Israeli cultivar, "Michal" needs 425 chilling hours. Producing fruit in just three years, Michal has firm, juicy yellow apples shaded with orange and red. Their flavor is similar to that of "Jonathan" apples, notes the Urban Permaculture Institute. It becomes sweeter for up to two weeks at room temperature. The medium-sized fruit is ready for picking in June and July.